Our Belden Restoration Project (pictured left) is kicking off this week with our initial pre-construction meeting with the contractor. This project is part of our US EPA Targeted Watershed Grant and is one of the largest sites with the worst water quality in the watershed. We’ll be changing the landscape to get rid of mine spoil (gob), exposed toxic clay plus we’ll install a steel slag leach bed and a settling pond. We’re really expecting to see some major changes in water quality because of this project. The Fern Hill (HR-42) Project (right) is much smaller, encompassing only one strip pond and a road side ditch. 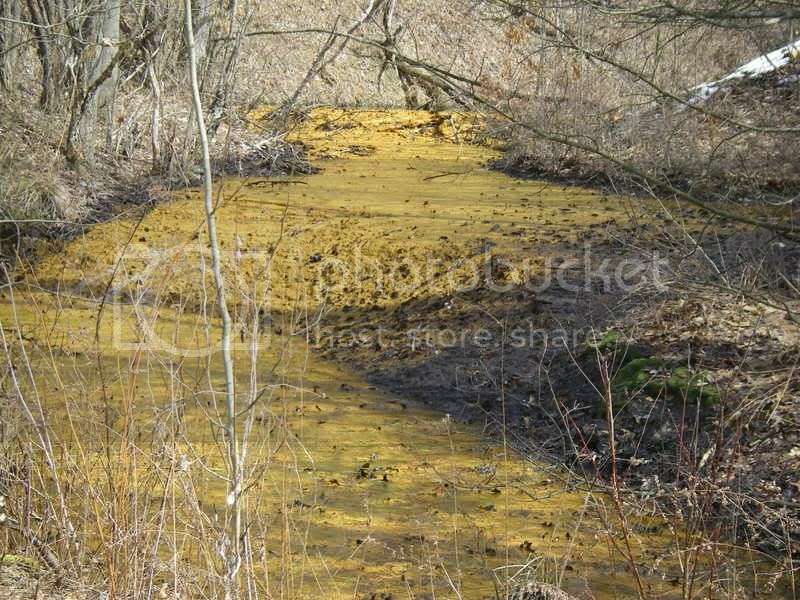 At the very edge of Huff Run here, there’s a huge plume of orange acid mine drainage precipitate dumping right into the stream. Studies have shown that there was no mining was done in that vicinity but that there is fracturing of the rock and soil on the hillside. We will reclaim the closest, largest strip pond uphill of this site and expect the effluent from the plume to slow down. Funding from this project is from the Office of Surface Mining (OSM) and the ODNR, Division of Mineral Resources Management. The Mineral Zoar Project is just outside of Mineral City and straddles Mineral City-Zoar Road. 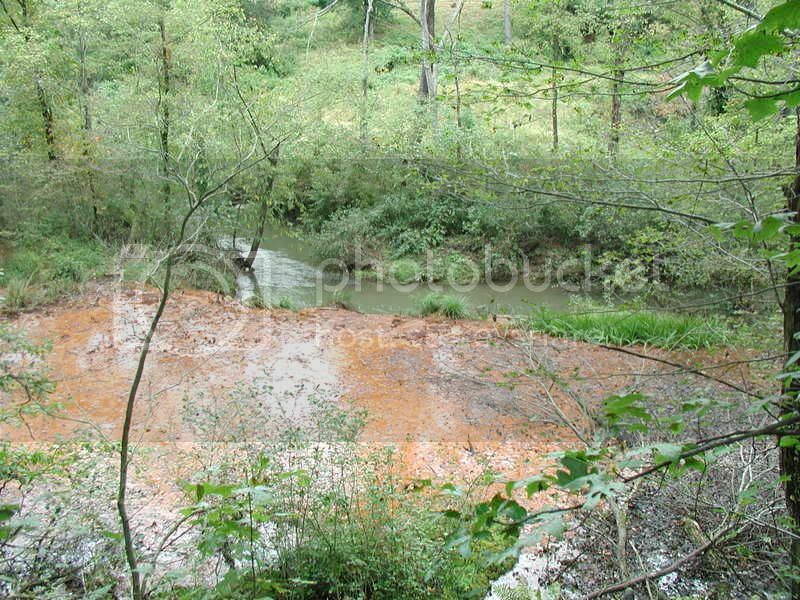 Two deep mines discharge into a wetland and into the start of a small tributary on the site. We’ll be installing a reverse alkaline producing system (RAPS) using the existing wetland and will create another wetland across the road. We expect to see all the metals to be removed with this system. Mineral Zoar is also funded by OSM and ODNR. Our last two projects are bonuses! 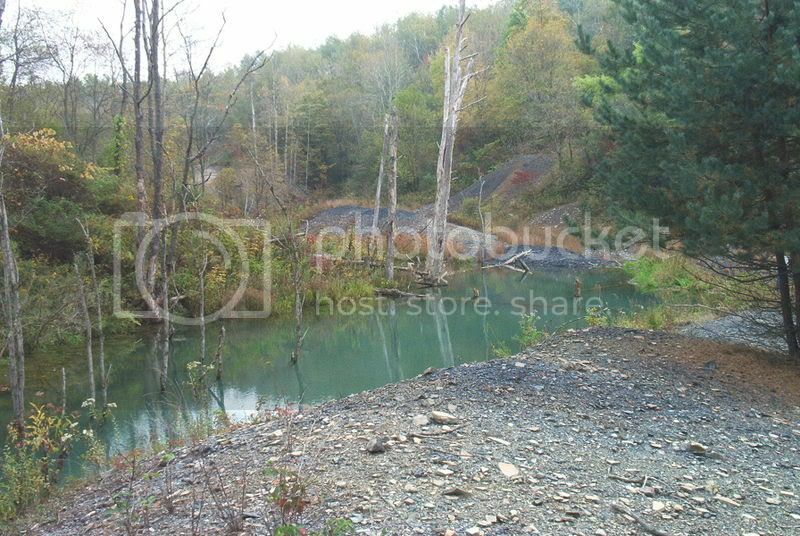 These abandoned mine lands are recently abandoned – the mining company forfeited their bond and are no longer obligated to do the law required reclamation. Instead, ODNR, Division of Mineral Resources Management, Abandoned Mineland Division picks up the work. These two sites without catchy names, HR-25 (shown on left) and HR-22, are both in Tuscarawas County and definitely have some pretty nasty orange water. AmeriCorps Volunteer in Service to America (VISTA) members serving at Rural Action, ReUse Industries, Habitat for Humanity, Good Works, and Sunday Creek Associates met at Rural Action last Friday to celebrate Appalachian culture and share resources at our first VISTA Gathering of 2008. 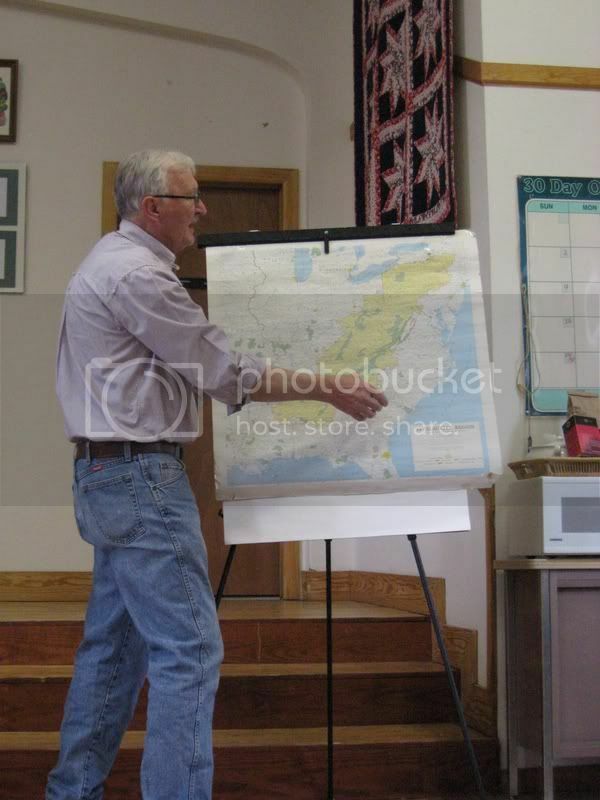 Bruce Kuhre, retired Ohio University professor of sociology (pictured left), gave a dynamic presentation on the history of the Appalachian region, how definitions of the Appalachian boundary have shifted over time, and how this history has shaped the culture of the area today. As a result, we are always looking for new opportunities to learn more about Southeast Ohio and its history, culture, geography, and people. If you have a resource to share with our VISTA members – maybe you are an avid storyteller or could give a tour of a local place of interest – please contact AmeriCorps VISTA Leader Tori Patterson at 740.767.4938. One of the best parts of planning an exciting event like the Adventure Auction is the opportunity to showcase some of our region’s unique local businesses, who are making this event possible by making generous donations. Through these donations, the event will give auction-goers a chance to not only support Rural Action, but also explore the best the region has to offer. Below you will find profiles of just a few of the local businesses who have donated to the auction. For a complete auction catalog (and to purchase tickets!) visit www.adventureauction.org. One unique Adventure Auction Package will include items from three businesses located in Eclipse Company Town: Jana’s, Zoe, and On the Path. Driving into the sleepy one-street town outside of the Plains is sure to conjure images of a coal-mining boomtown once bustling with activity. This historic site is home to three unique locally owned businesses. Jana's, a soul food cafe utilizing local ingredients to create one of a kind comfort food (including delicious brunch and dinner menus), donated a gift certificate that is sure to whet the appetite for regular visits. Zoe provides a fine-dining experience with a changing menu featuring fresh seasonal food. For the Adventure Auction, Zoe donated a gift certificate the buyer may decide to use when the season--and Zoe's menu-- is bursting with flavor during the spring and summer harvests. The Eclipse Company Town Package wouldn't be complete without a contribution by On the Path, Ltd, who offer a variety of activities to nurture your body, mind a spirit, such as massages, reiki, and radical forgiveness programs. Another unique local business, Touch the Earth Adventures, donated a full moon kayak paddle adventure, which is a great example of owner Mimi Morrison's mission for the business: to empower individuals through connecting with the Earth. One of the Adventure Auction's sponsors, Shade Winery, is a local business showcasing the distinctiveness of the region. This micro-winery "is reviving old traditions and striving to create new ones," and utilizes local ingredients whenever possible. Look for Shade Winery's Dry Elderberry Table Wine and Schnuckelputz Lemon Ginger Wine at Athens retailers such as Casa Nueva and the State Street Krogers. Click Here to see a full list of Adventure Auction donors, including many more amazing local businesses! Rural Action is currently seeking AmeriCorps VISTA members for both short-term summer positions and full-year terms. Summer Associate VISTA positions will begin June 18th and run through August 15th. Benefits for Summer VISTAs include an $833/month living allowance and a $1,000 education award to be used for student loans or future education. Full-year positions begin in mid-July 2008 and run through mid-July 2009. Benefits include: an $833/month living allowance, a $4,725 education award or $1,200 end-of-service cash stipend, health benefits, vacation and sick leave, and hands-on experience and training. 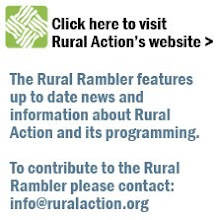 Visit the Rural Action website for more details. To apply, go to www.americorps.org and enter “Rural Action” in the Advanced Search. With questions, contact Rural Action AmeriCorps VISTA Coordinator Candi Withem at 740.767.4938 or candi@ruralaction.org. Congratulations to Rural Action Central Appalachian Network partner Anthony Flaccavento, a food and society policy fellow and director of Appalachian Sustainable Development. Anthony's op-ed, "Eat Locally, Ease Climate Change Globally" ran in the Washington Post on March 9. The photograph to the left is of Anthony's farm in southwestern Virginia.